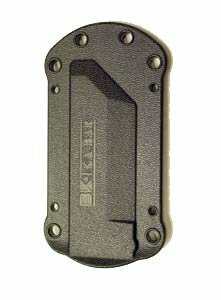 The first Becker knife released under the KA-BAR product line, the BK11CSM is an updated version of the Becker Necker. Made to the same dimensions as the original, the CSM Necker features a Carbon San Mai blade. Carbon San Mai is a carbon steel core with a 410 stainless steel laminate overlay. Each knife comes with a plastic injection molded sheath. Watch for more, U.S. made, Becker Knives to be released for sale in mid-to-late November 2008!